A report on Thursday claims Apple has signed explanatory news website Vox to an upcoming subscription service expected to debut alongside a video streaming solution at a special event on March 25. 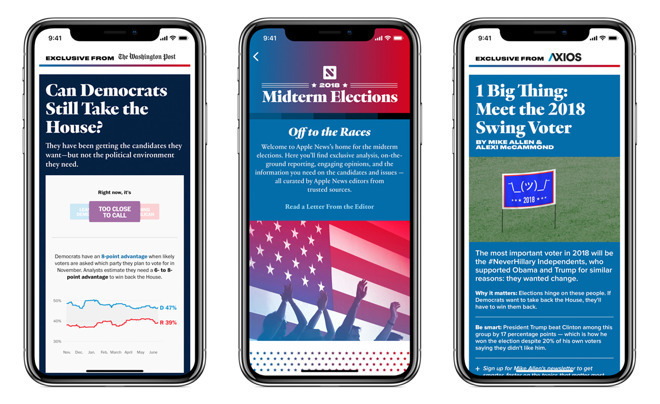 Apple News displays special midterm elections section in 2018. Citing a person familiar with the matter, Bloomberg reports Vox Media's marquee Vox publication will be available through Apple's news subscription service when the product launches. Other Vox Media outlets, including The Verge, Recode, SBNation, Eater and Polygon, are not included as part of the initial deal, the report said. It is unclear when those publications will join Apple's service, if at all. While Vox does not currently run a subscription platform, CEO Jim Bankoff at the 2019 South by Southwest conference in March said a for-pay, membership-based model is in the works. The company's reported deal with Apple could be designed to test the waters prior to a formal launch. Apple is widely expected to reveal a news and magazine subscription service at a special event on Monday. The iPhone maker is said to be leveraging its massive installed user base in ongoing negotiations with publishers, but major outlets are reportedly reluctant to join the initiative due to steep revenue sharing terms and restrictive data sharing policies. Apple is supposedly demanding a 50 percent cut of revenue on a subscription rate of $10 per month, with remaining funds evenly doled out to participating publications. Along with Vox, Apple has reportedly landed The Wall Street Journal, but other publications are less agreeable to contract conditions. In an interview with Reuters published today, The New York Times CEO Mark Thompson intimated his company declined to join Apple's platform, and argued other publications should do the same. AppleInsider will be covering Apple's special media event live from Cupertino on March 25 starting at 10 a.m. Pacific, 1 p.m. Eastern.